Every month DiScoro writes about (digital) resources that can be used in schools. In addition you will find issues that may inspire you. See Services for workshops, training etc. Two more concept cartoons that can be used in class. Use pictures of characters with the speech balloons that fit your situation . See also earlier posts Concept Cartoons and Concept Cartoons-2. Many Brainpower problems can also be introduced with the Concept Cartoon format. I discussed the first problem with grade 5 and grade 6 pupils. The were perfectly able to reason what would happen, even though they we never instructed on Archimedes’ Law. 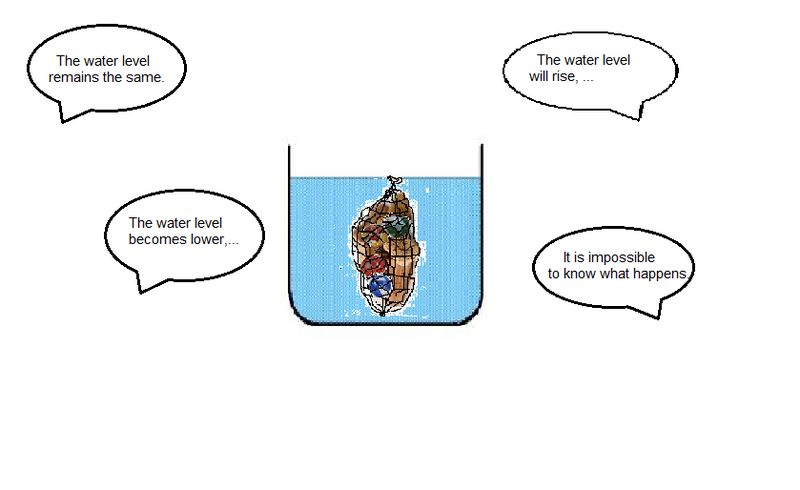 You can also use the concept cartoon in grade 8 or 9 after students have learned about Archimedes’ Law. Do not be disappointed if the students are confused. Problem: We take a glass basin and place a plastic net with marbles and korks in it. We make sure that the net with the marbles and korks floats in the water. There is nothing that sticks out above the water and the net does not toach the bottom of the basin. You can also bring the materials in class and let pupils fill the net so that it floats in the water. Discuss and finally cut the net. The answer requires reasoning about why this happens, but there are so many factors that these should come from the students and do not fit into the speech clouds. What will happen to the water level if we cut the net open? The second concept cartoon is suitable for a younger age group (grade 2 or 3). 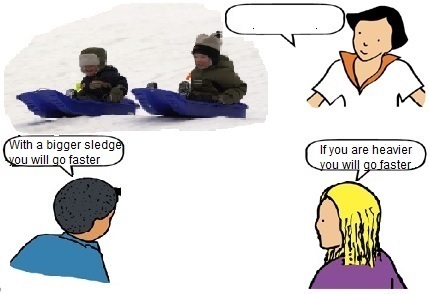 How can you go down faster on your sledge? During the discussion words and concepts like speed, acceleration, friction (both with the surface as well as air friction), weight, size may be used.